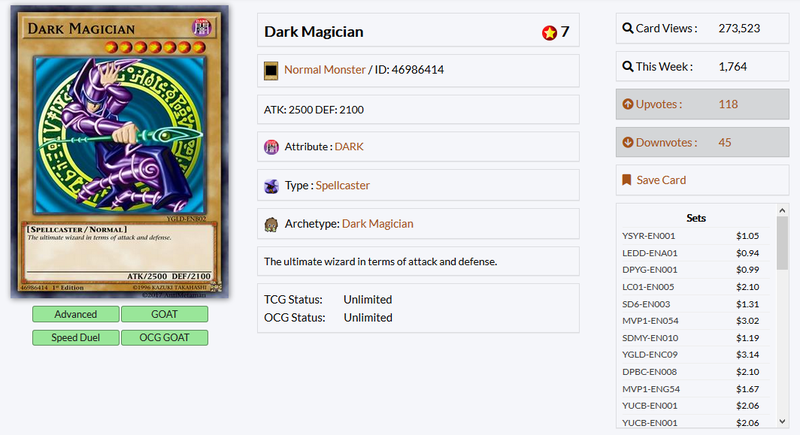 YGOPRODeck has a Card Database which receives frequent updates. Simply search for a card to receive all the information you need about it. We also have a complete card viewer under the database that lets you filter cards. YGOPRODeck article writer meepmoto27 has written an excellent and extensive series about the history of the Yu-Gi-Oh! TCG meta. This will give you a knowledge of how Yu-Gi-Oh! evolved in the competitive scene. Yu-Gi-Oh! has a Speed Duel format (based off the Duel Links video game) that released in 2019. Speed Dueling is a good way to learn the game as it’s a “cut-down” version of the full Yu-Gi-Oh! experience. Speed Dueling is a specialised version of the Yu-Gi-Oh! TRADING CARD GAME. Skill Cards let you become your favourite Yu-Gi-Oh! character, and give you special abilities to use in your Duels! YGOPRODeck has a host of easy-to-use decks available for players to use. You can attempt to create your own deck if you wish using our online deck builder! You can also price the deck and easily purchase it at the click of a button. Once you’ve grasped the basics then it’s time to pilot some more advanced decks. We have a huge variety of decks on the site that range from fun non-meta decks to extremely competitive meta decks.